Greetings from the Chelsea Community Garden! 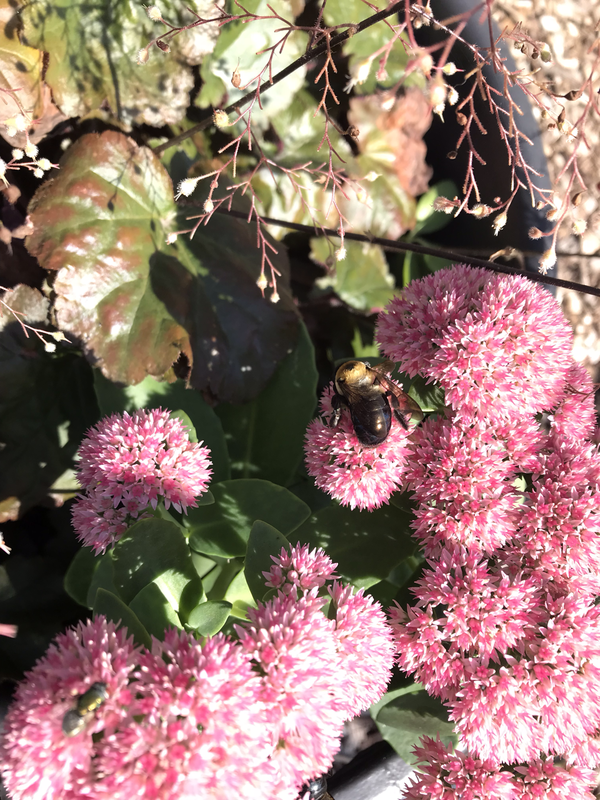 As the growing season turns to last harvests and shorter days, there are still bees buzzing and flowers blooming in the garden. Capturing these moments in nature is more challenging in the city, but is worth the extra effort to literally “stop and smell the roses”! It has been my honor and privilege to be coordinator of the Chelsea Community Garden for the past year, and for me, the autumn winds are already bringing thoughts and plans for the 2019 growing season! But I also want to take some time to reflect on the accomplishments, challenges, and lessons from 2018. I came to the garden not so long ago, with my husband and two kids, after being on the waitlist for about 5 years. Our first season was transformational as a family. I grew up in my Italian grandfather’s half-acre city garden, and dreamed of providing a childhood of growing for my own kids. We have no outdoor space at home, so we planted in pots on our roof, all over the house, around trees and patches of green throughout our neighborhood. Joining the garden gave us our own patch of land to grow whatever we wanted, and even gave us the gifts of gorgeous lilies and alliums planted by the previous gardener. We ate like kings that first summer, feasting on juicy heirloom tomatoes, spicy peppers, all kinds of herbs, and bright orange carrots that tasted just like my grandpa’s. We learned how to prune raspberries, apply organic pest control, about different soils and seeds, experimented with watering and weeding, and so much more. Gardening breeds generosity and requires diversity. Gardeners are always seeking homes for extra seedlings in spring, and especially in good growing years, sharing bountiful harvests with friends, families, and neighbors. Our garden membership includes growers from over 11 different countries, spanning 5 continents. Our youngest gardeners are around 2 years old and others represent multiple generations, including several octogenarians! We live in different neighborhoods, come from different lifestyles, work in different industries, and garden for different reasons. Collectively, we value growing. Just as a bountiful harvest thrives from the biodiversity of plants, weather, insects, care, and attention it receives year round, our garden community thrives as we each bring something unique to feed our common purpose, and what we value. I wish there was a community garden in every neighborhood that wants one. It’s exciting to see and hear about more growing space opening up in Chelsea! I look forward to seeing, and helping more gardens grow in our city as much as I look forward to planting my own garden bed next season! This blog post turned out to be more personal reflection than I had intended, but check back for more diverse perspectives soon!